The Warragul and Baw Baw regions over recent years has seen significant interest in cycling and growth in regular participants with the club growing some 300%. 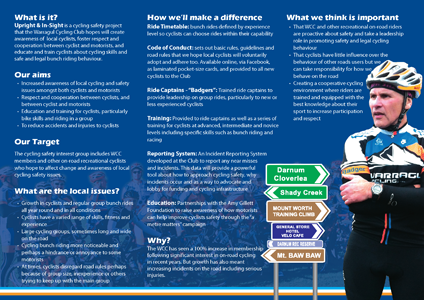 After much discussion and debate it was agreed that the cycling club needed to be proactive and take a leadership role in looking at the safety of cycling and cyclists in our region and see if we could do anything to help. This lead to the Upright and In Sight program. The purpose of this page is to provide more information about this initiative. Background of the Upright and In-Sight initiative. Click on the image below to download a pdf detailing our initiative. 01/07/2013 – Prelaunch media release. For enquiries or booking information, contact John Davine via the Secretary.